Gregory Moore, the editor of the Denver Post, is, I believe, a good man grappling with a difficult challenge. 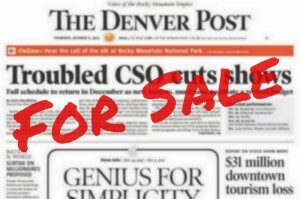 The Post, as described in an article at Poynter.org by Steve Myers, is essentially eliminating its copy desk. Eleven are going or gone, a couple have been reassigned to other duties, and the nine survivors become assistant editors assigned to the various newsroom departments. When explanations of these and similar changes are made, there is talk of moving away from “assembly-line editing” and “outmoded nineteenth-century industrial processes” to some bold, modern, fresh, immediate journalism that removes all those unnecessary “touches” between the writer and the reader. This is, of course, cant. The brutal facts are these: Terrified by declines in revenue, newspapers are shedding employees to save money. They are attempting to keep as many reporters as possible to generate content, and they are gambling that you will tolerate shoddier work.